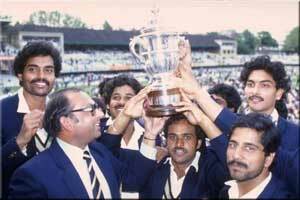 Third ODI Cricket World Cup was also played in England between 8 International Teams. 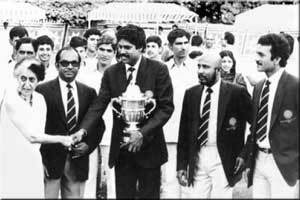 England, India, New Zealand, Australia, Pakistan, Sri Lanka, West Indias and Zimbabwe participated for the 3rd Cricket World Cup tournament. Total 27 games were played at 15 different venues of England. Format of this world cup changed and this time each team played the others in its group twice to determine the four semi-finalists and winner of semi finals contest will play final match. India upset West Indies in the low scoring Final match and won the match by 43 runs. Mohinder Amarnath (India) was the man of the match for his 26 runs and 3 wickets in his 7 overs spending just 12 runs. 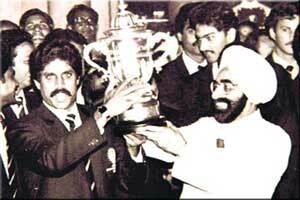 Main attraction of this world cup was 20th match between India and Zimbabwe. Electing to bat first India lost early 5 wickets of just 17 runs. 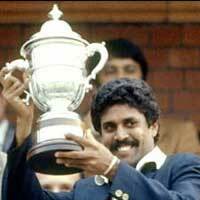 Skipper Kapil Dev came in middle and played long last remembering inning of 175* runs and put India on very good totals of 266 runs. 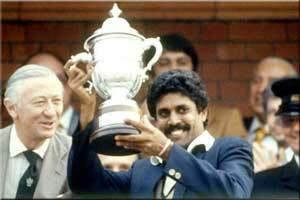 More importantly Kapil Dev and Syed Kirmani added record 126 runs for the 10th wicket partnership. 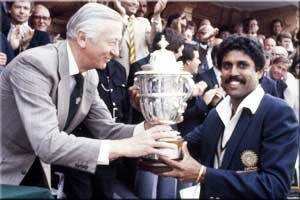 India won this match by 31 runs and Kapil Dev was man of the match for his recod breaking and splendid inning of 175* runs. Two groups of four, as in 1979. This time, though, each team played the others in its group twice, not once, to determine the four semi-finalists and winners of semis contest to final.